I hate to clean the bathroom. I don’t mean that in a cute, prissy, girlie way. I mean that in the most sincere, shudder-as-I-do-it way. Trying not to breath as I scrub down the toilet. Wearing gloves and washing my hands, changing my gloves more than once. I love a clean bathroom. I could tell you all the businesses in Madison that have bathrooms you want to rest your bottom in, and all the places that you should hovercraft OR avoid, for fear of losing your cheeks. It might be considered an obsession or phobia. I don’t really care, honestly. It’s me and I can’t seem to change it. I’ve (literally) lived in fear of the possibility of peeing my pants after entering a bathroom, finding the facilities not up to par. Wetness on the seat, crud around the base, dampness in front of the toilet… I’m having a hard time typing it because the visuals come to mind. Not to mention the sink – if it looks like my hands will get dirtier by using the sink – oh no. No thank you. My obsession knows no boundaries — public or private bathrooms, must be clean. Yes, give me a cool, shiny bathroom (warmth and humidity exacerbates any unsightly, uncleanliness in a bathroom, in my opinion) with sparkling throne, clean scent, wash basin and towels… ah. It doesn’t have to be perfect. Perfectly clean and sanitized is a bonus, but absence of P & P (figure it out), clean smell, clean throne and floor, sink… I can do it. I had a friend who would scour her bathroom before I came over, concerned it would not be “good enough” for me. I didn’t know I was that transparent. I clean the bathroom about once every other day, wiping down the base, giving the inside a good once-over, and Swiffer-ing the floor. Even though I’d clean the bathroom, though, there was this nagging sense (and scent), saying something wasn’t right. It was the stuck on yellow scum on the inside of the toilet, I was sure of it. Five man boys using a toilet over an extended period of time, and you’ve got ring-around-the-toilet. No matter how hard I scrubbed, how much I cursed, or how many drop-in toilet bombs I lit off, it remained. Until this – taking a pumice stone to the toilet. One day while cleaning the bathroom, close to blacking out from the realization of it all, it dawned on my brain to try a pumice stone. I had either heard, read or seen it referenced somewhere as THE best way to clean toilet scum, filed it in the messy cabinets of my brain, and without knowing it, sent a page to retrieve it that day. Good boy. Pumice stone, pumice stone? Where can I find a pumice stone? Like a headless chicken I circled and clucked, asking my brain page to help me out once again… All I had was the old stone I’d used on my feet a few times, but it would do. I gloved up, grabbed some baking soda (figured a paste of soda would help?) and got to scrubbing. By golly. The sight of flaky, crusted peediddle, and the stench of it’s wonder being released into the air was enough to let me know it was working. I scrubbed and scrubbed that stone down to a little nub, cleanliness as motivation. I likened it to a diaper explosion where you KNOW you have to clean it, vile as it is, but once you’re done you’ll be very pleased. And I was. It was as if I had received a brand new toilet. The smell is gone, the unsightly piss ring is gone, and now when I clean my toilet you see sparkling porcelain and smell clean air. 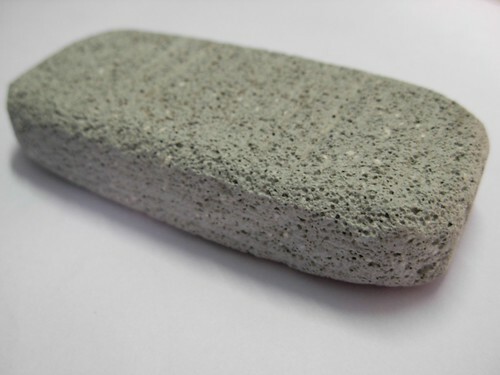 If you’ve got some hard, stuck-on grossness inside your toilet that you simply can not scrub off, grab a pumice stone. I’ve had some disgusting crud under the rim of my toilet that couldn’t be Kaboomed/scrubbed/bleached, sweet-talked away. I took my pumice stone (that I use for my feet), and with some elbow grease, got rid of it. It ate up over half the stone, but that’s just fine. Wet it a little bit (you’ve got water right there in the bowl) and scrub away. No chemicals, no fumes. Good stuff. I have another post in queue regarding my thoughts on bathroom cleanliness, but I’ll save that for another day (here it is).